Former USF men’s soccer player Ben Sweat made his first international start with the U.S. Men’s National Team on Tuesday in a 1-1 draw against Peru. Sweat made his first international appearance, however, last week in Tampa against Colombia. It was a homecoming of sorts for Sweat, the 27-year-old defender whose roots in the Tampa Bay Area run deep. He grew up in the Tampa Bay Area and caught the eye of current USF women’s soccer director of operations Alex Delgado the first time he saw Sweat play soccer. Delgado was at the youth soccer game watching his nine-year-old brother play soccer. Sweat was just eight years old at the time. He was playing against other kids who were older and bigger than him yet, according to Delgado, he was one of the best players on the field. Sweat continued playing soccer near home with the Clearwater Chargers, a development program affiliated with the Tampa Bay Rowdies, before he started playing for the men’s varsity team at Palm Harbor University High School. Delgado became the head coach of Palm Harbor when Sweat was a sophomore. “He was an amazing attribute to the program and, to be honest, he’s probably the best player to ever come out of [Palm Harbor University High School], which is one of the most prestigious programs in the state of Florida,” Delgado said. Sweat helped lead his team to a state championship in 2009 and was twice named the Pinellas County Player of the Year by the Tampa Bay Times. Sweat started his career at USF in 2010 under then-coach George Kiefer. Sweat went on to set a USF record with 78 game appearances. Whenever he was healthy, he was on the pitch, playing at Corbett Stadium. Ironically, Sweat’s first international call-up brought him from New York City FC (NYCFC) back to his home in Tampa. One of his first duties was to report to team practices — which were hosted by USF at Corbett Stadium. For Sweat, practicing back at USF then playing at Raymond James Stadium in Tampa was his first time being back in Florida since NYCFC played against Orlando City on Aug. 26. Sweat and NYCFC are approaching the MLS playoff where they are currently the No. 3 seed in the Eastern Conference. With City, Sweat has established himself as a regular starter at right back, playing on a weekly basis on the same field as Spanish legend David Villa. 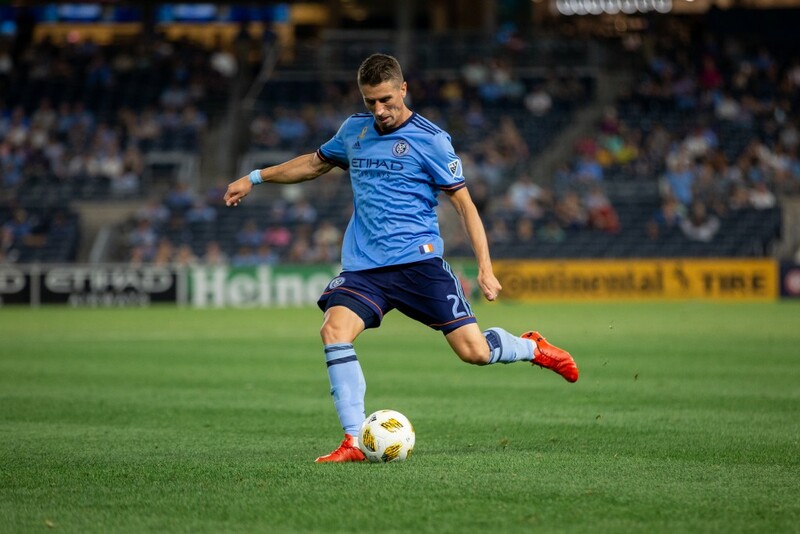 The USF alumnus has had success with NYCFC since he was brought on the team last season. He has 41 appearances and one goal with the side. Despite being a standout in high school and college, Sweat’s professional career has been anything but smooth. He was drafted 14th overall in the 2014 MLS SuperDraft by Columbus Crew SC where he inconsistently played with the first team. The next year, the team waived Sweat. About a month later in 2015, Sweat signed with the Tampa Bay Rowdies, an NASL club. He made 33 appearances in two seasons with the Rowdies and left at the end of the 2016 season. He tried out with NYCFC in 2017 and was signed to the club in February 2017 — about two years after being cut from the Columbus Crew. Now he’s playing at the highest level on the international stage with the U.S. Men’s National Team. Delgado knew that Sweat was due for some more good fortune from his experiences — both his successes and failures. When he got the call up two weeks ago, Sweat was flooded with congratulatory messages. Kiefer and Delgado both were among the first to reach out. Sweat said that Delgado was “buzzin’” when he found out about Sweat’s news. “Since he got the call-up, I sent him a congratulatory text and he’s been in constant contact,” Delgado said. While in Tampa, Sweat had to fill more than his obligation to the national team. It was a homecoming of sorts for him. While he was away, several influential people in his life remained in Tampa watching his progression. He came back as a star. “My family, a lot of my friends, old coaches, my former clubs, high school and, obviously, the University of South Florida, a lot of my past is still here,” Sweat said. Even though he was flooded with attention since returning to Tampa, Sweat still made time for everyone. He went out to dinner with Delgado before leaving. Last week, he even spoke with some of the USF men’s soccer team at their pregame dinner.